Etching on laid paper with small margins lined onto a conservator’s support sheet. 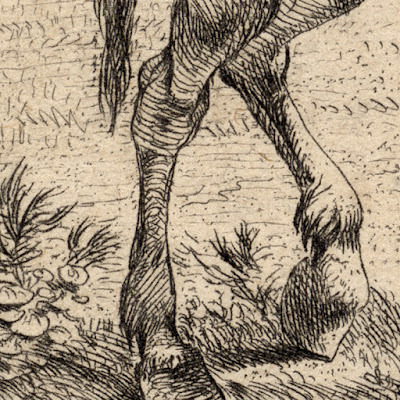 Condition: delicate, crisp impression—a stronger impression than the state iv impression held by the British Museum (see BM no. 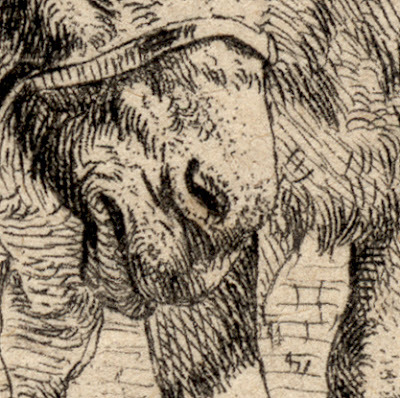 S.824)—with replenished losses (see the upper corners) and tears (now virtually invisible) and laid upon a conservator’s support sheet of fine washi paper. 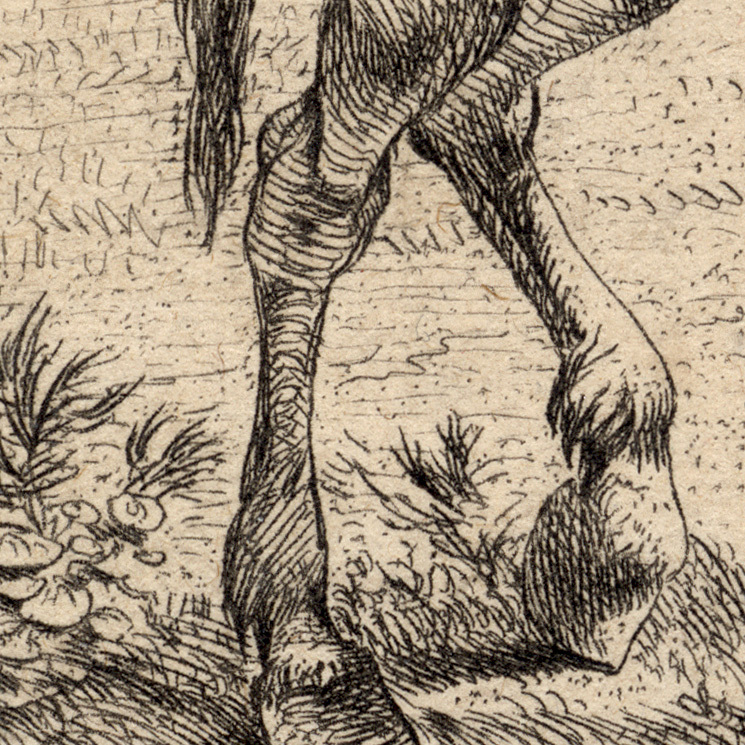 There is a significant patina of handling marks and age toning. This “patina” of the print’s history has been retained rather than being addressed by restoration as the colour and tone acquired over the centuries is beautifully subtle and would be a shame to lose. 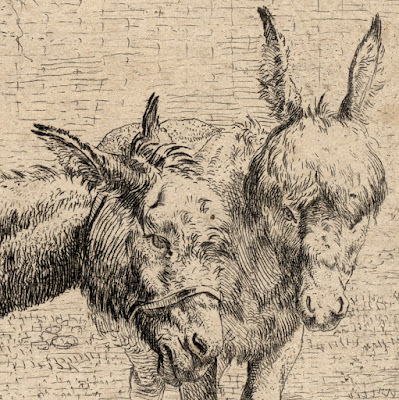 I am selling this insightfully drawn etching of two donkeys/mules with their ears alert to the sounds around them—note how the foreground donkey is listening to the roaming dog in the distance—for AU$132 (currently US$101.46/EUR87.37/GBP77.28 at the time of this listing) including postage and handling to anywhere in the world. 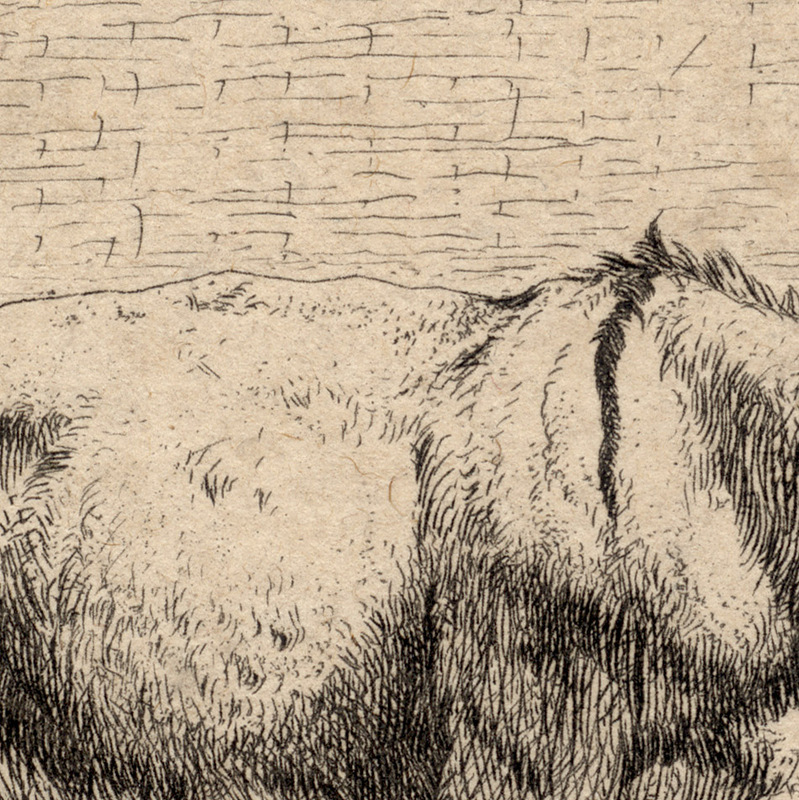 If you are interested in purchasing this small etching revealing Dujardin’s delicacy of touch when drawing and his understanding of the mercurial elements that make animals appear to be living and “real”, please contact me (oz_jim@printsandprinciples.com) and I will send you a PayPal invoice to make the payment easy. 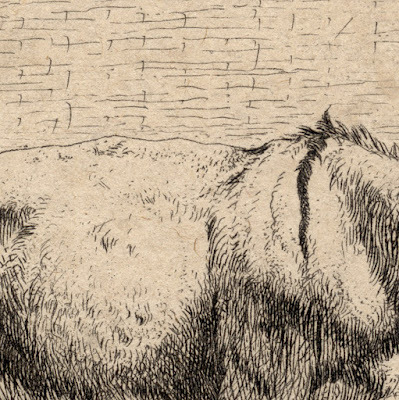 Like his contemporary, Rembrandt, Dujardin had the same remarkable gift to metaphorically breathe “life” into his portrayed subjects. 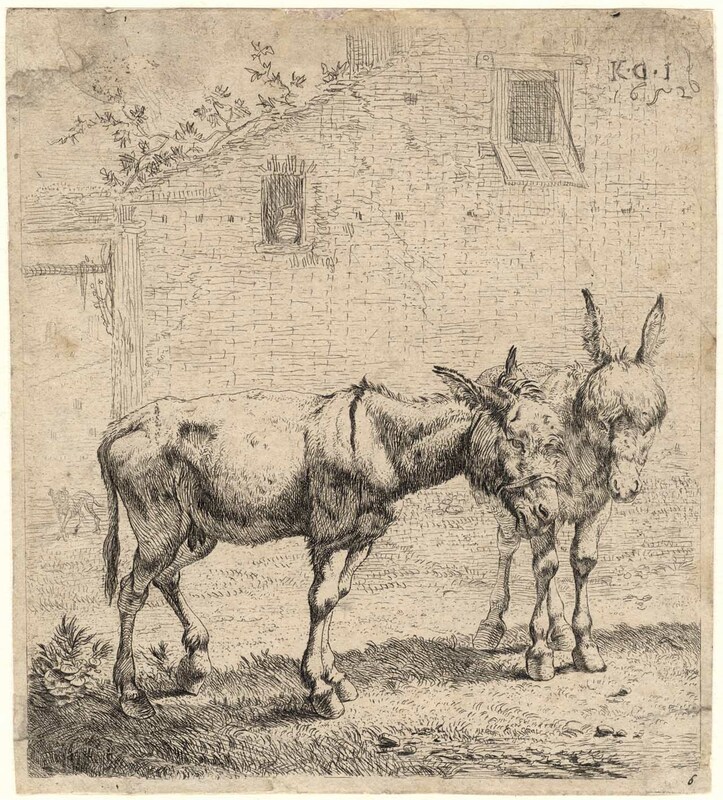 For instance, Dujardin is able to instil a living spirit into his representation of these donkeys by suggesting with just the single raised back leg of the foreground donkey that the animal has been standing for too long in the same position and is taking pressure of its legs. 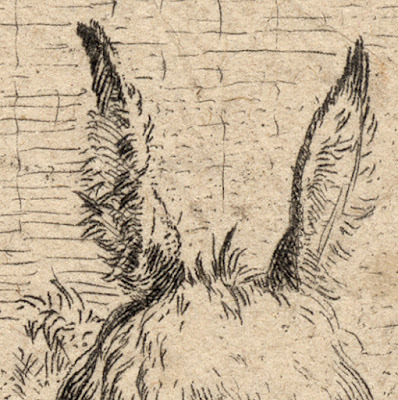 Dujardin is even able to suggest that the same donkey is thinking by angling its ears in the direction of the wandering dog in the distance. What makes Dujardin’s etchings very different to those of Rembrandt, however, is the way that light is expressed. For example, Rembrandt is famous for his use of theatrical lighting—termed chiaroscuro—where strong light and equally strong shadow create meaningful tensions in a scene. 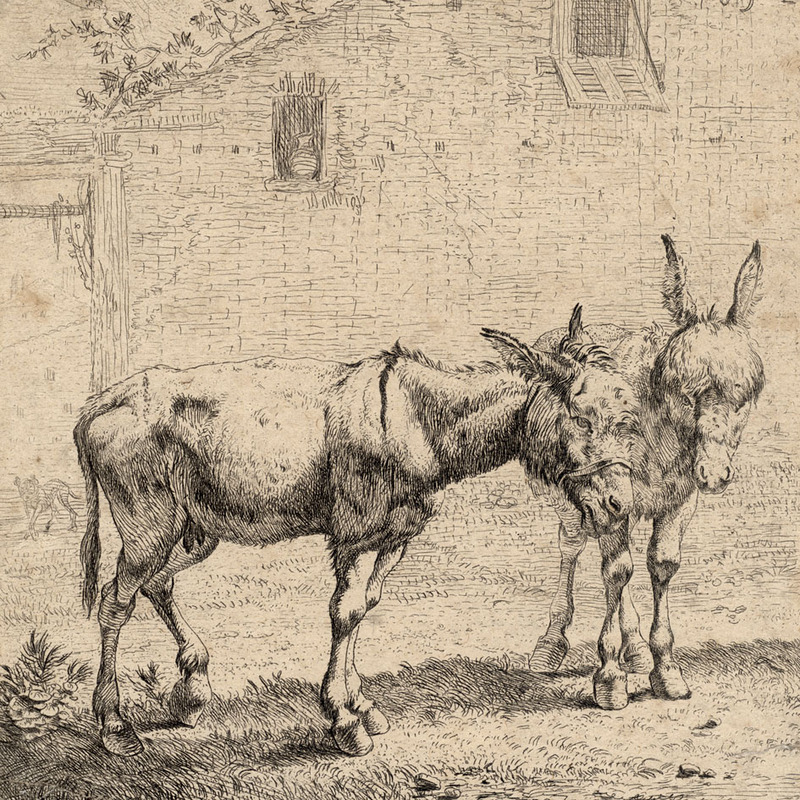 By contrast, Dujardin uses ambient light (i.e. scattered light) to pervade a scene with a feeling of endless space and warmth.